For the first time, the European Union has approved a genetically modified seed for planting. The European Commission, which made the decision, says the variety of maize developed by the Monsanto company can now be grown in any EU nation. Observers say a sudden switch to the crop is unlikely, not least because it can be grown only in warmer states. 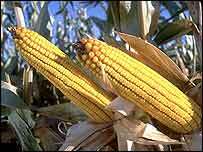 The maize, known as MON810, is modified to be resistant to the European corn borer, a damaging insect pest. In 1998 it was approved for use by the governments of Spain and France, and has been grown in Spain. Under European law, any seed which is approved in one EU country is automatically approved in all the others. But the process of extending approval for MON810 beyond France and Spain was suspended for five years by the EU moratorium on new GM products. The moratorium was lifted in May this year, and the European Commission has now approved MON810 throughout the bloc. David Byrne, the European Commissioner for Health and Consumer Protection, said in a statement that the maize had been "thoroughly assessed to be safe for human health and the environment. "It has been grown in Spain for years without any known problems; it will be clearly labelled as GM maize to allow farmers a choice," he said. But Becky Price of research and campaigning group GeneWatch UK told the BBC that assessment of MON810 might be a contentious area. "When this was assessed back in 1998, all a company had to do was to present notification that the crop was 'substantially equivalent' to non-GM varieties," she said. "If they were applying now, they would have to supply data showing that the crop is substantially equivalent." Beate Gminder, a spokeswoman for the Commission, told the BBC that any farmer within the EU was now legally entitled to buy and grow MON810, even though some countries like the UK have established their own sets of rules for assessing biotech crops. "It is legally not possible that the UK cannot allow planting if they haven't put in a safeguard clause," she told the BBC. By a "safeguard clause", Ms Gminder referred to national legislation designed to prevent spread of transgenic material from genetically modified crops into neighbouring fields of related plants - also known as "co-existence legislation" - an issue which several European governments are grappling with. "The problem is that only Denmark has established such legislation," said Geert Ritsema of Friends of the Earth. "To release these GMOs now is a recipe for disaster." Governments can however register an exception from the EC ruling on health and safety grounds, allowing a suspension of the legal right to plant within their borders - though they then have to prove their case. "Some EU member states including some of the newly joined countries are sceptical about genetically modified food, and we will be encouraging them to protest," said Geert Ritsema. There are seventeen variants of MON810, and the decision covers all of them. "All seventeen are southern varieties - designed for use in warm climates - so it's unlikely they will be adopted by northern farmers," said Becky Price. A more important issue which may prevent the adoption of MON810 is public opposition to GMOs, still strong in many European nations. Whatever happens with MON810, the symbolic significance of this development cannot be overstated; a continent which has led opposition to genetically modified agriculture is now, for the first time, allowing a GM crop to be planted throughout its territory.